I am working with A Spectacled Owl this week on a very fun Giveaway. Four lucky winners will end up with an H2OGo Water slide. See below and enter for your chance to win. I have been meeting some new blogging friends and have enjoyed the chance to work with them. Stop by all the co-hosts as well and visit. Summer will be here before we know it and that mean trips to the beach, hanging outside with friends, picnics in the park and fun times with our families. Wouldn't it be fun to have something new and exciting in your backyard? H2OGO! has a new line of water slides that will bring a smile to the face of parents that remember summertime fun in their backyards as kids and to the faces of kids, who will love the new features of the H2OGO! Backyard Water Slide. This fun slide features a Speed Ramp, which is a tough, inflatable launch pad that will help propel you head-first down the 18-foot slide and soften the initial "flop" as you start your ride. The Splash Lagoon is under the Speed Ramp and funnels water throughout the slide so there won't be any slow spots and it'll be a smooth, fun ride the entire time. You can choose either a single, double or triple slide, so no matter how many kids you have or how many neighborhood kids come over to have fun, there will be plenty of room for everyone! You can buy the H2OGO! Backyard Water Slide on Amazon and at Toys 'R Us. Now for the giveaway! 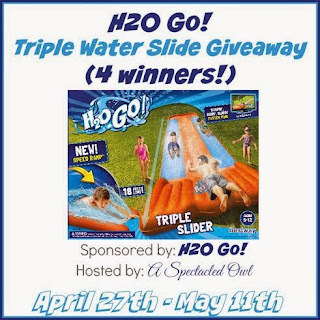 We're giving away FOUR triple H2OGO! Backyard Water Slides!